Need opinion. I am including a scan of these 2 wacky items. Got them way back in the early 1970's when regular series were being issued. Problems is I have no idea how I got them. My brother was also collecting then. Dont know if they came through him. I eventually ended up with everything. They are made of a cloth material. Scan of back of Quacker Oats is included. Not patch. The only other time I tried to find out what they were, was I sent a letter and photos of them to Roxanne Toser of the Non-Sport Update after I got hold of her book THE BEAT GOES ON from 1997(her Wackys reference book). She told me she did not know what they were. Of note, have a total of 8 of them. 2 are Series 1 and the other 6 are Series 2. Just a guess, but it looks like they were cut from a bolt of wacky fabric, which is known to exist. Don't know off the top of my head if the titles on the fabric are known. Gallery might have more info? I agree. These are from the cloth bolts (of which there are a number of different ones). I have several pieces of swatches from some of the Wacky cloth bolts. Although these two titles are not on the samples I have, the pics look exactly like how it would appear if a title was cut out of the cloth. On the samples I have, the titles are often printed overlapped leaving few entire titles. Scoot, any chance you might show a scan of one of your cloth samples. 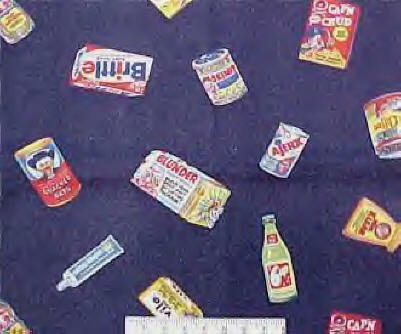 Years ago, when I started to see info on Wacky Packages, I saw photos of pieces of Wacky cloth. I figured the ones I had may have come from cloth. However, since I didn't have any cloth, was not sure. Makes alot of sense, somebody just cut it up. Thanks to everyone for their input on this. Don't think I've ever seen such clear photos of that fabric. Darned cool.